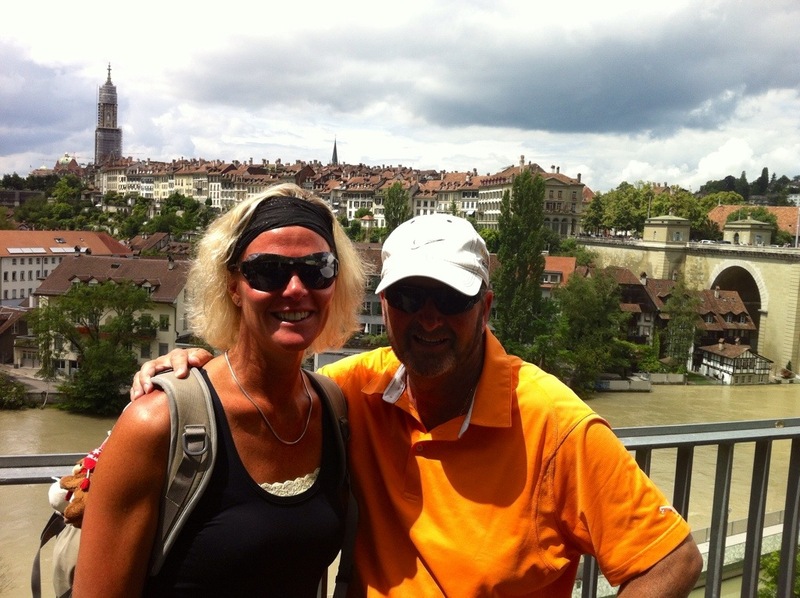 After our day in The Jura we headed for Bern which is the capital of Switzerland. It is a lovely city – we had parked at the bottom of the old town and the sight looking up is impressive. 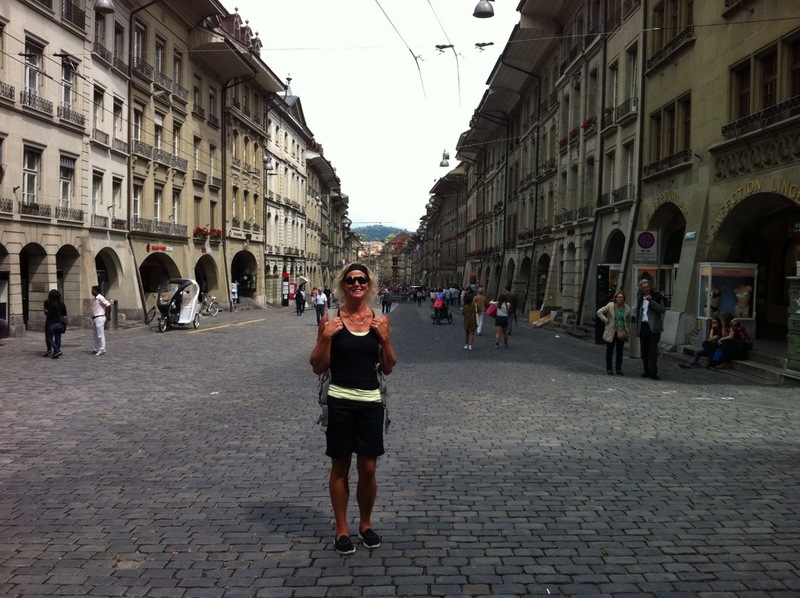 In 1983 the historic old town in the centre of Bern became a UNESCO World Heritage Site and Bern is ranked among the world’s top ten cities for the best quality of life. 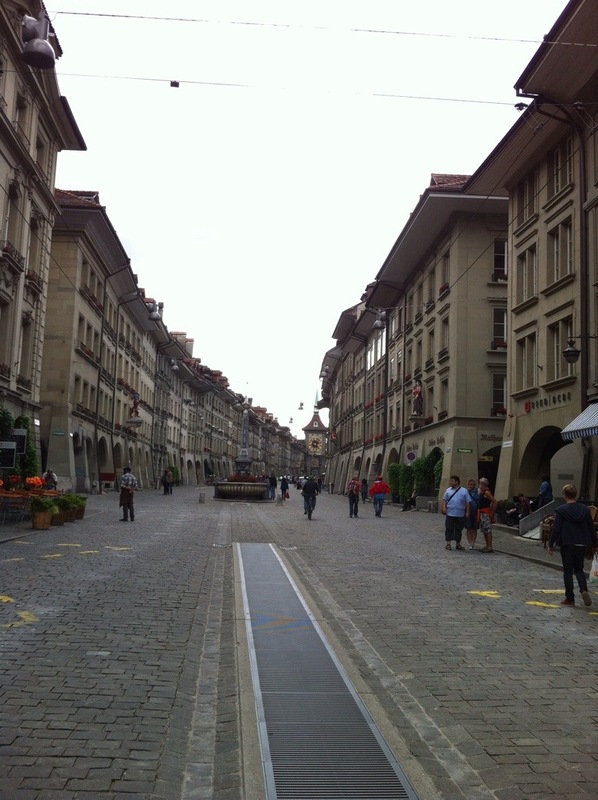 The structure of Bern’s city centre is largely medieval. 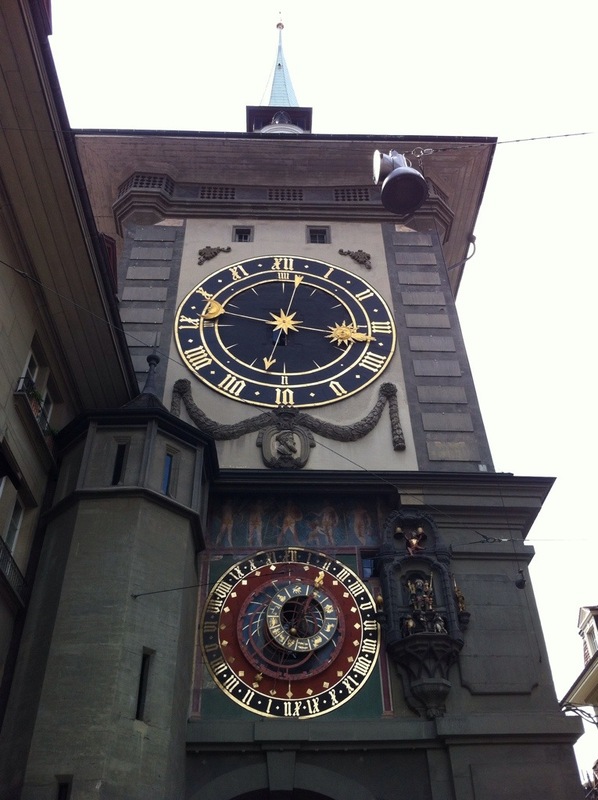 Perhaps its most famous sight is the Zytglogge (Bernese German for “Time Bell”), an elaborate medieval clock tower with moving puppets. 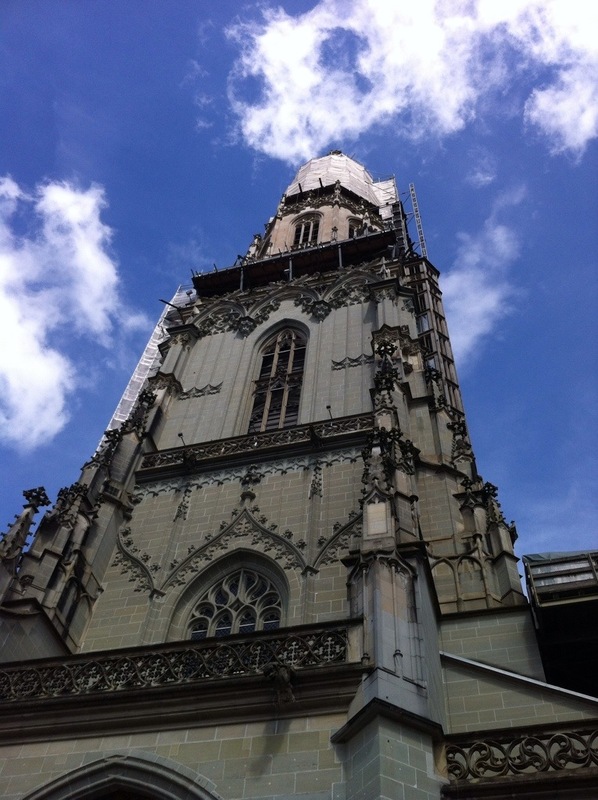 It also has an impressive 15th century Gothic cathedral, the Münster, and a 15th-century town hall. Thanks to 6 kilometres (4 miles) of arcades, the old town boasts one of the longest covered shopping promenades in Europe. The covered arcades were impressive with a large variety of shops – it was probably lucky it was Sunday or we may still be there. 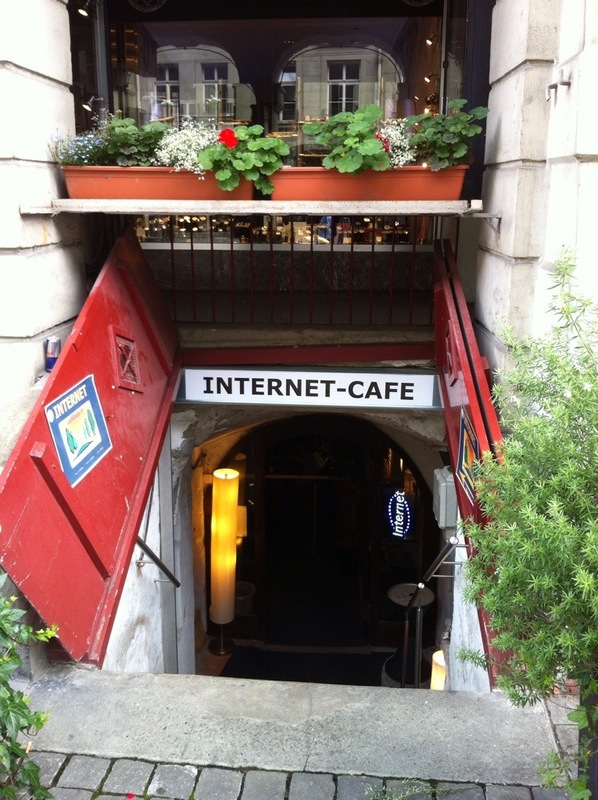 They also have underground shops. They have these double doors on an angle which reminded me of going into a dungeon. 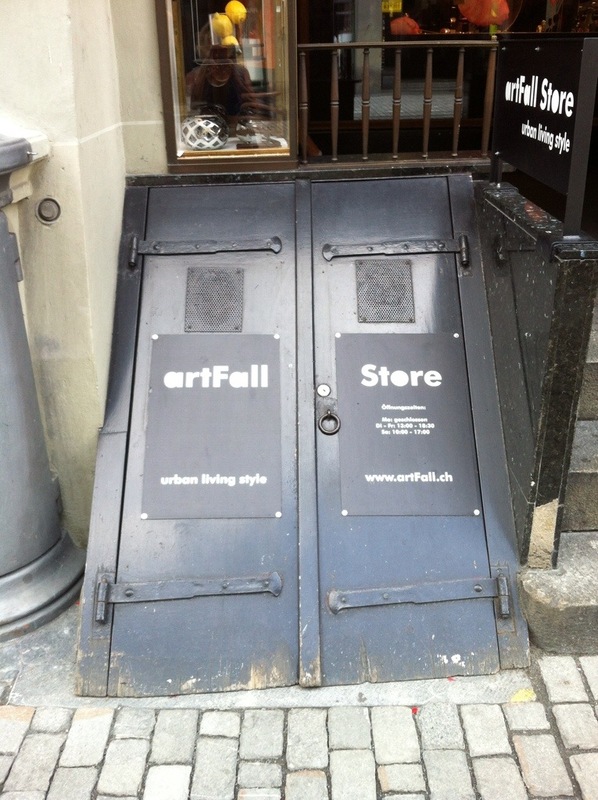 Once open they have stairs that lead down to an underground store. The original bear pit is a concrete hole in the ground filled with big stones and very little vegetation – not the best environment for the bears. The new open air enclosure is much better with lots of trees and is on the edge of the river. We managed to spot one of the bears in there. 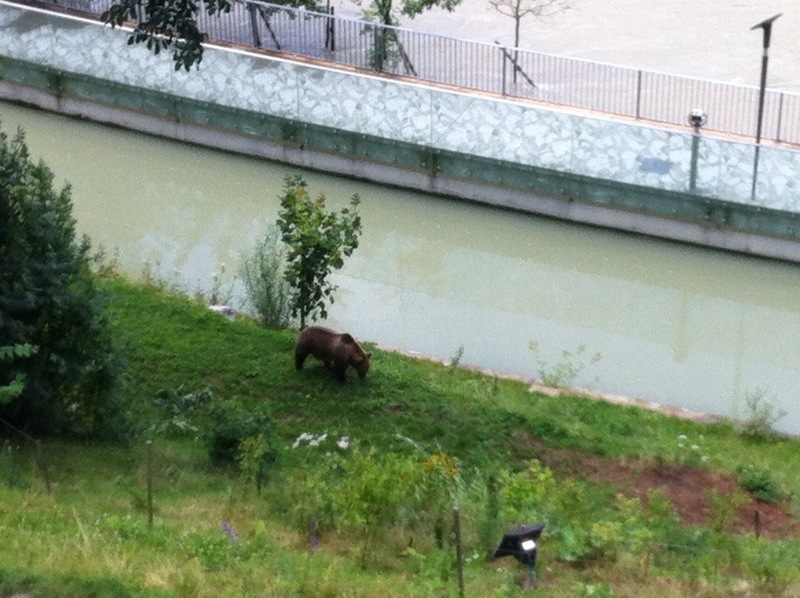 When we returned later on they had moved two of the bears to the old bear pit so you could see them closer up. The Federal Palace (Bundeshaus), built from 1857 to 1902, which houses the national parliament, government and part of the federal administration is also in Bern. Switzerland is the closest state in the world to a direct democracy. For any change in the constitution, a referendum is mandatory (mandatory referendum); for any change in a law, a referendum can be requested (optional referendum). Through referenda, citizens may challenge any law voted by federal parliament and through federal popular initiative introduce amendments to the federal constitution. Any citizen may challenge a law that has been passed by parliament. If that person is able to gather 50,000 signatures against the law within 100 days, a national vote has to be scheduled where voters decide by a simple majority of the voters whether to accept or reject the law. 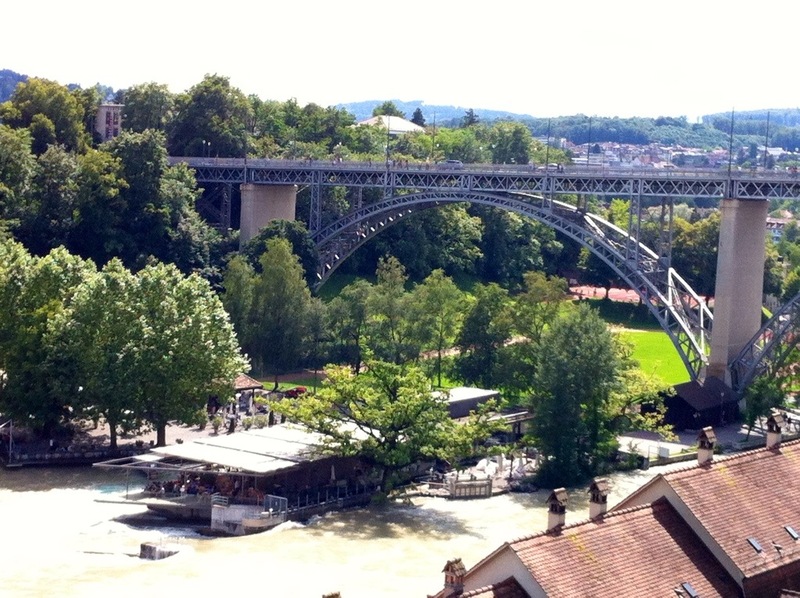 There are three main rivers in Switzerland – the Rhine, the Rhone and the Aare. All the rivers originate in the Swiss Alps. The Aare runs through Bern and because there had been a lot of rain in the days before we were there it was at full capacity and we could see where there had been a bit of flooding. There were a couple of houses right down by the river pumping out water. If you look at a map of the city you can see that the Aare runs round the old city like a moat with the city standing high on the hill. 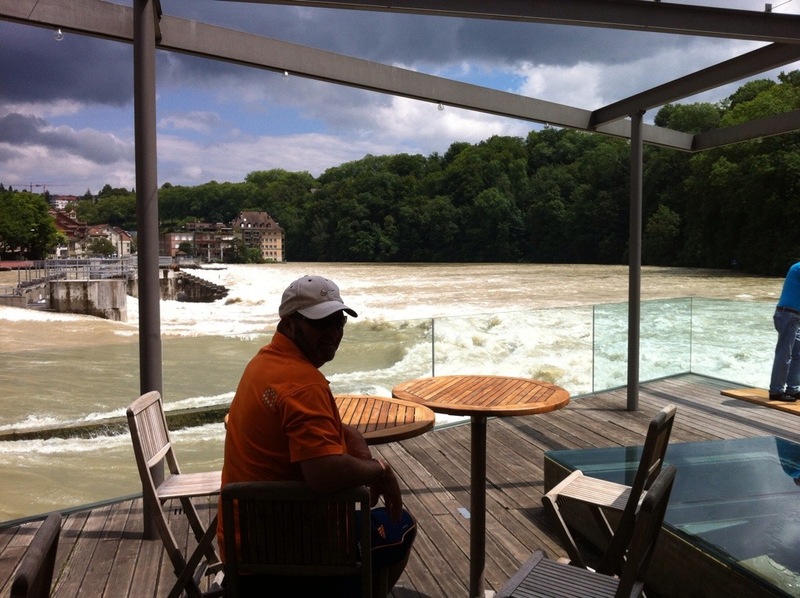 The Aare river flows into the Rhine which then goes into the North Sea. The Rhone ends up in the Mediterranean. We had lunch in this restaurant that was built over the river and with the river flowing as fast as it was it was quite impressive sitting where all the action was. 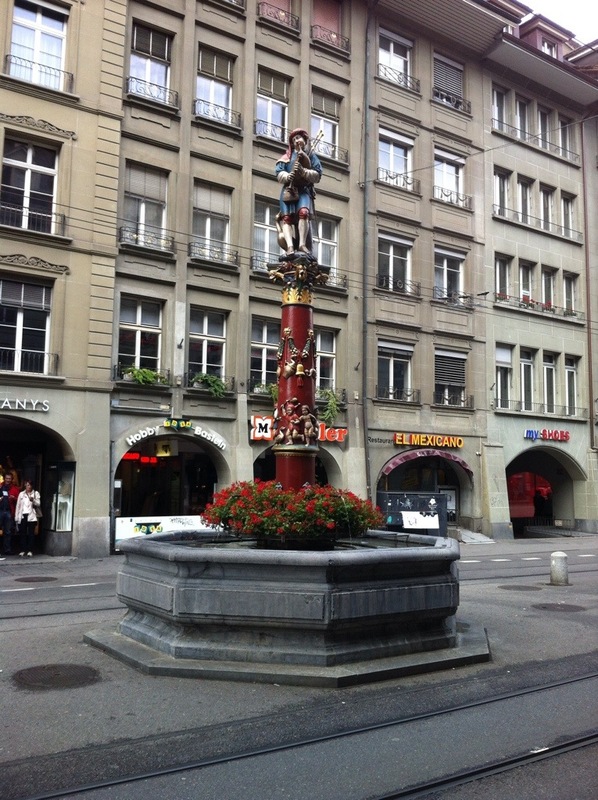 There are over 100 public fountains in the city of Bern of which eleven are crowned with Renaissance allegorical statues. The statues were created during the period of civic improvement that occurred as Bern became a major city-state during the 16th century. The fountains were originally built as a public water supply. 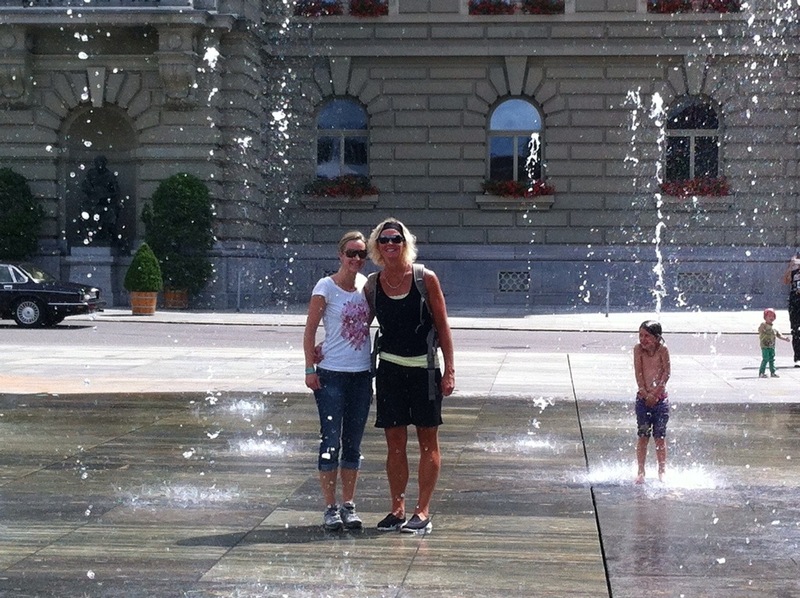 As Bern grew in power, the original fountains were expanded and decorated but retained their original purpose. 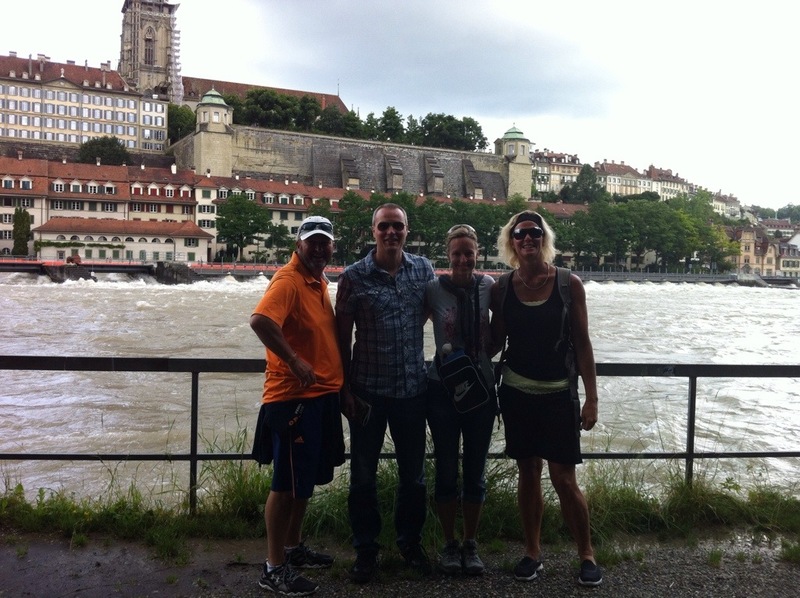 After exploring Bern we drove onto Interlarken to stay the night. 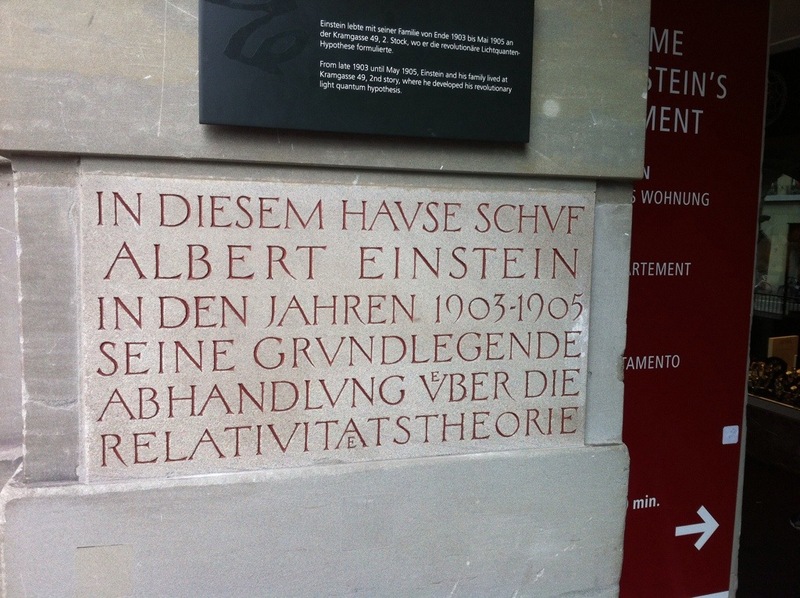 Interlarken is in the canton of Bern of which Bern is the capital of not only the country but also this canton. It is an important and well-known tourist destination in the Bernese Oberland region of the Swiss Alps, and the main transport gateway to the mountains and lakes of that region. The two famous mountains here are the Eiger and the Jungfrau which is one of the main summits in the Bernese Alps standing at 4,158 metres tall. Jungfrau translates to maiden or virgin. The town is located on the Bödeli, between Lake Thun and Lake Brienz, and alongside the Aare river that flows between the two lakes hence the name Interlarken. 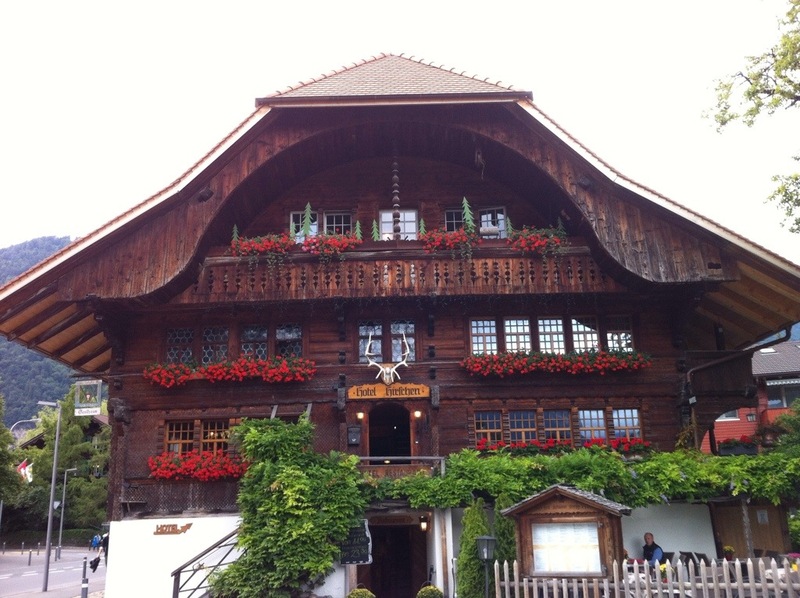 We stayed in a traditional guesthouse called Hotel Hirschen which had been built in 1622. It was very quaint and the ceilings were very low so I had to be careful not to knock myself out while walking around. We walked into the centre of town to have dinner and watch the World Cup final. Interlarken definitely has a different feel than other towns in Switzerland due to it being a major tourist destination.